Jenkins Johnson Gallery, San Francisco, is pleased to present its first solo show by Los Angeles photographer Melanie Pullen, previously represented by Stephen Wirtz Gallery. The exhibition features photographs from her new series Soda POP! that plays with cultural assumptions, taking things typically associated with childhood, such as computer games and soda pop, and putting them in questionable nighttime settings. She heightens this sense of unease by featuring young people marginalized by society, neglected street kids or male prostitutes. Melanie Pullen’s work has been exhibited internationally and has been included in various museum exhibitions such as the Museum of Contemporary Art in Jacksonville Florida and Museo Jumex in Mexico City. There will be an opening reception on Thursday, November 5, from 5:30 to 7:30 pm. The exhibit runs from November 5, 2015 through January 9, 2016. Suffering from insomnia an eight-year-old Melanie Pullen would hang out her bedroom window on Christopher Street in New York City. There she became friends with a man who would stand outside her bedroom window every night at exactly midnight, a seven-foot tall African cross dresser who worked the corner of her street until 3 am. He would tell her crazy stories while fixing his messy blond wig between gigs. Their friendship, while unconventional, helped Pullen survive the lonely, late-night hours. Exploring these previous states of mind and her current experiences as the mother of a young child she found herself awake and alone late at night after her son had fallen asleep. In the same way her cross dresser friend entertained her then, she now often occupies this time playing Candy Crush Soda Saga on her cell phone, from which she has derived the title for the series. The game depicts sickeningly sweet colors and candy that sparkle and pop while a deep voice congratulates you with statements such as “juicy” and “tasty” as you work your way to clearing a plane of corresponding treats. In the same time window in which her cross dressing friend worked, midnight to 3 am, Pullen meets young men around her Los Angeles neighborhood, in places such as the Los Angeles Metro Station or the Santa Monica Pier, seedy locations that are safer visited by the light of day. Pullen pays each $20 to photograph them and has them select a vintage soda bottle they relate to or that rouses an emotion in them. She lets them pose as they wish, usually photographing where she approached them. The organic, slightly impulsive nature of the shoots further plays with our ideas of what’s appropriate for young people and how it actually manifests itself, emphasized by the knowledge that her subjects are exactly what we don’t expect of typical young Americans. The interactions Melanie Pullen has with these young men, who she refers to as “lost boys”, are very personnel experiences. In contrast to the 80 plus person team on her series High Faison Crime Scenes, Pullen only brings along her assistant for the Soda POP! shoots. While photographing this gives the opportunity for conversation and connections to form. In one of these encounters she met a young man with albinism, and as she photographed him he opened up to Melanie about his life. He grew up in foster care after his single mother died when he was six years old and now that he is in his early twenties he is transitioning out of the system. His story and his unique look had a great impact on Melanie and she is now planning on using him as a model for future projects. Pullen has had some comedic meetings as well. She recalls stumbling upon a couple making out by the train station and approaching them to ask if she could take one of the gentlemen’s photographs. This choice apparently made the other jealous and they proceeded to fight in between each of the shots. Pullen also comments that a surprising number of these young men she meets refer to themselves as artists, they show her their work, and more often than not she enjoys it. Pullen describes the photographs in Soda POP! almost as “fake soda ads”. They are reminiscent of subliminally sexual advertisements, with the shape of the soda bottle correlating to the shape of the curvy model we so often see holding it up to her mouth as a phallic symbol. The underlying connotations of the images offer the same impression as one of those iconic ads but in a context that has been turned onto its head, the young men pose with their prop, not in a safe and clean studio but on a street corner or in the subway. She expands on the hyper sexualized concept by photographing women drinking from the vintage soda bottles, these images are close up shots of the bottles, showing no more than the women’s lipstick tinted mouths. With the majority of the exhibit representing portraits of young men, these bottle portraits serve by incorporating a feminine aspect to the show. Melanie Pullen was born in New York City in 1975. She is self-taught and was raised in a family of photojournalists, publishers and artists. Currently she lives and works in Los Angeles, California. 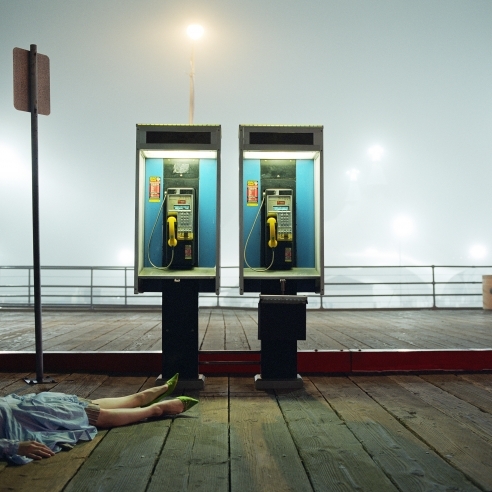 Pullen has been recognized for her ongoing photographic series High Faison Crime Scenes in numerous publications including the San Francisco Chronicle, New York Times Magazine, LA Times, ArtReview, Vogue, Elle, Fortune, W, GQ, Rolling Stone, Nylon, Photo, Art Forum, National Public Radio, CBS Radio and CBS News. She is available for interview and will be present at the Soda POP! reception for the artist.